The Tamworth 250th Mosaic, a project of Arts Council of Tamworth, was created in 2016, Tamworth’s 250th year, by hundreds of children and adults and dozens of tireless volunteers working with mural artist David Fichter, Arts Tamworth director Juno Lamb and Brett art teacher Melanie McBrian. 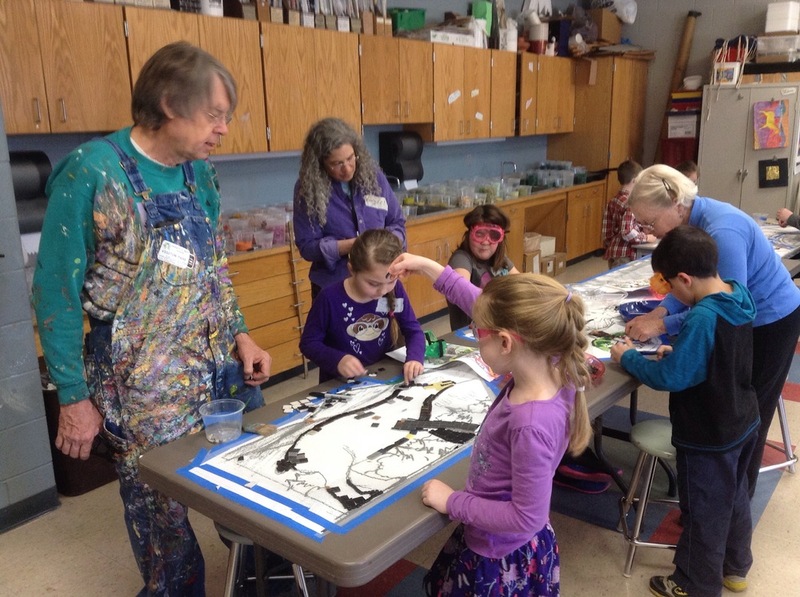 The Tamworth 250th Mosaic, a project of Arts Council of Tamworth, was created in 2016, Tamworth’s 250th year, by hundreds of children and adults and dozens of tireless volunteers working with mural artist David Fichter, Arts Tamworth director Juno Lamb, and Brett art teacher Melanie McBrian. The project was supported by The Tamworth Foundation, the K. A. Brett School, the Tamworth PTA, the Yeoman’s Fund for the Arts, the New Hampshire State Council on the Arts, The Other Store, BEAM Construction Associates, Inc., Club Motorsports, and all Arts Tamworth’s donors and sponsors. Dedications: in memory of Helen and Jim Breasted; in honor of the K. A. Brett teachers; in memory of Joan Ayer Remick Casarotto—artist, storekeeper, gardener, Tamworth historian; in memory of Joan Cave; in honor of Peggy Johnson, Genius of Music, Painting, Poetry and Life; “A Little Help For Our Friends”; Thank you, Tamworth artists, young and younger—you make our lives brighter; in honor of Tamworth Volunteers; in honor of Betsy Thompson and the Rev. William Huntington Thompson; in memory of Arthur Walden and Chinook. Wow—we had an amazing community response to every stage of the mosiac process. Hundreds of kids and adults, helped along the way by many dedicated volunteers, built, mounted and grouted two gorgeous mosaics. Thank you, amazing community, amazing volunteers, and all our donors, sponsors and funders! Watch the slide show and/or scroll down below the slideshow to learn more about who's who and what's what on the mosaic. Click HERE to read the remarks delivered at the June 14, 2016 mosaic dedication ceremony and HERE to read the Tamworth Civic News article about the project. The project was also featured in a sweet article by Barbara Neville Wilson in Sweet 16. Read page one HERE and page two HERE. 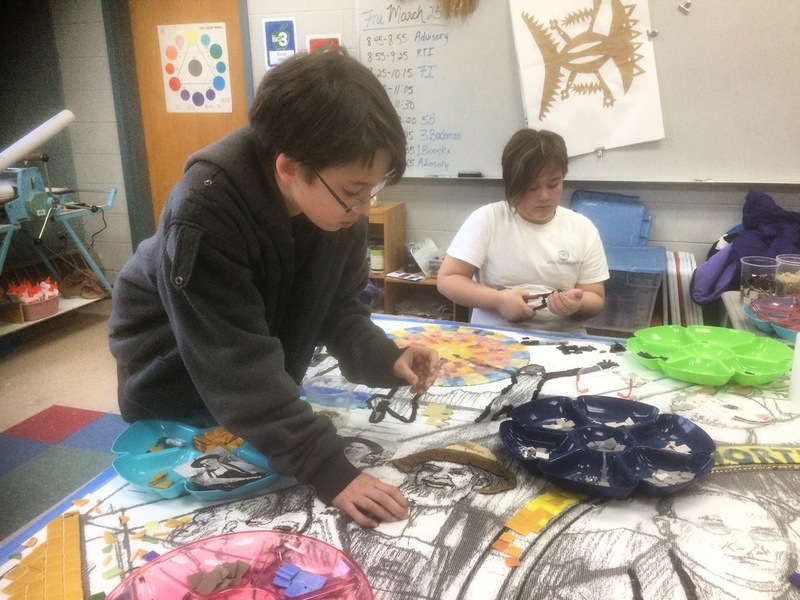 He presented to every class at Brett, and to the community, explaining the process of designing and building a mosaic. In March we built the mosaic. On the first day, kids and community members unloaded thousands of glass tiles from the back of David's van, and helped set up the mosaic templates on large tables in the Brett art room. Community members came every day to work with students. David oversaw the entire process with generosity and humor. Slowly parts of the mosaic began to come together. 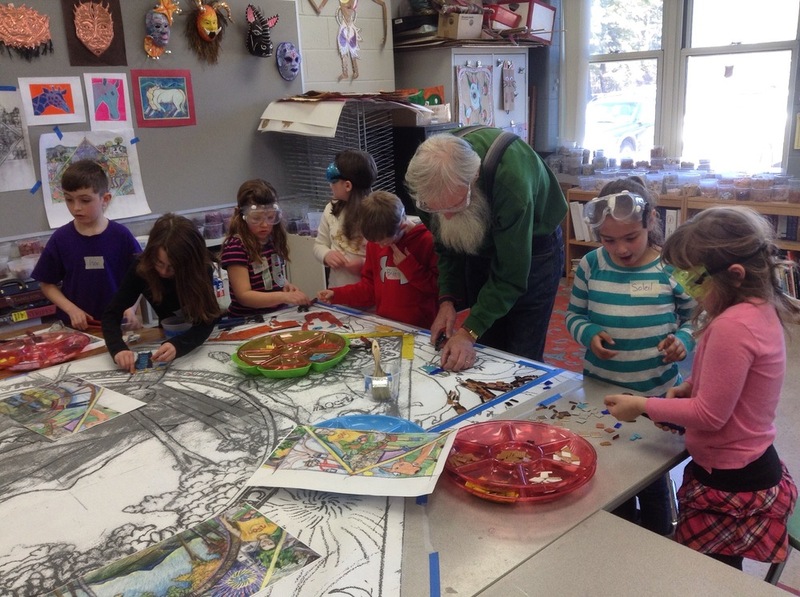 Kids worked together on sections of the mosaic. Building a mosaic is slow and patient work. Every piece of glass in the mosaic was placed by a human working in community with other humans of every age. We used David's design as a color reference. If you used only tiles of one color, there wouldn't be a design. But because you have hundreds of tile choices in each color family, you still have to make a lot of creative decisions along the way. People of every age worked on the mosaic, from this little one up to someone in her mid-90s. A student works on his grandfather's hat. Sometimes the visual reference is a photograph. Building portraits is particularly complex, but David knows tricks. Two of Tamworth's former head librarians build the depiction of the Cook Library. in this case a gorgeous print of the library at night by Willey Fromm. Former Brett students, now all grown up, came back to work with current students. So many community members volunteered! A brother working on the portrait of his brother. Wire-rimmed glasses, no less, fashioned of shiny shards of glass. Duroc is cemented and then screwed to the wall. Working to finish the first mosaic to be mounted. Brayering the mosaic to make sure the bits of glass stick to the tape that is all that's holding them together at this stage. Mosaic building is a fun date. Brayering the back side of the mosaic. You can see the ridges on the backs of the tiles that will help them stick in the mortar. We had wonderful turnout at all of the community build sessions. We sat around the tables chatting, learning more about each other and our town. As sections were completed, we taped them with heavy plastic tape to keep them intact. One of our state reps came all the way from Hart's Location to work on the mosaic. A mother works on her son's t-shirt. One of our selectmen builds his great-great-great-great-great-grandfather's lace collar. Mounting the first pieces of the mosaic to backer board. and lucky that the custodians made us leave by 10PM every night! Lowering the tile into the cement. Only these couple of cutout pieces were mounted this way; most were slapped up onto a vertical board already mounted to the outside of the school. Putting pieces of the mosaic together. When sections of the mosaic have been built on different tables, they need to be matched before mounting to correct gaps or overlaps. 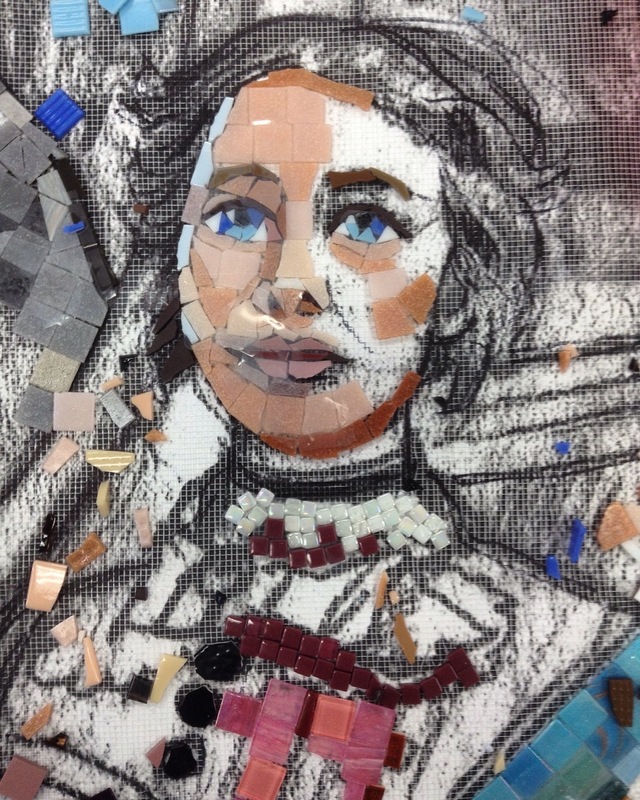 Creating a plastic template of the mosaic. These lines will be transferred to the cement board outside as guides for where each piece needs to be mounted. Removing the template and mesh from the back of a mosaic section in preparation for mounting it. The last time anyone gets to see the back of this mosaic section! Transferring the lines from the template. Spreading mortar around the outside edge of a mosaic section before it's mounted. On a chilly morning, using tiny chisels and dental tools, volunteers scrape excess mortar out from between the tiles to make room for the grout. The beginning of a big weekend of mounting and grouting. We tape off the mosaic in small sections and use many different colors of grout to make the mosaic pop! It's fun to work in close quarters on the staging—lots of talk and jokes, birthdays and birthday cake. The LAST piece of the second mosaic is mounted! Grouting in the shade of the staging. David mixes many colors of grout. Cleaning up the second mosaic to prepare it for grouting. The final day of grouting. Because we HAVE to finish, volunteers work until long after dark by the light of their cell phones. Not deer, but happy and proud volunteers in the headlights. Both mosaics are completed! A close-up detail of the mosaic. This is just about how celebratory we felt at the end of this enormous project! ...to this! Wow. Thank you, David. Born in 1834. Teacher at the Jackson School. She married Ira Blake and they had one child. Ira died in the Civil War. She bought a farm, enlarged the orchard and turned the farmhouse into one of the early boarding houses. She kept diaries 1860-1888 that are now in the care of the Cook Memorial Library. Lucy was a lifelong church worker, a lecturer in the Grange, a caregiver. She had a long and full life – living to the age of 93. Member of the Lower Brule Sioux Tribe, born 1909 in South Dakota. Descendant of Meriwether Lewis. Tenth Mountain division in WWII. Hunter, trapper. 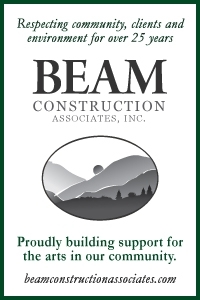 Trained arborist, agriculture degree from UMASS Stockbridge. Moved to Tamworth in 1950. Farmed 13 acres. Boston Post Cane holder. Died 2012. Arthur Treadwell Walden, born 10 May 1871, brought dogsled racing to Wonalancet, trained sled dogs, traveled to the South Pole with Admiral Byrd and Chinook, Alaska adventurer, author, Congressional Medal recipient. Died 1947, while saving his wife from a fire in the kitchen of their farmhouse. Chinook, born 17 January 1917, one of three in a litter from a cross of a St. Bernard mix and a descendant of Admiral Peary’s Greenland husky lead dog. He weighed more than 100 lbs. Chinook is the NH state dog breed. Died 1929 in Antarctica. Barbara Willey Fromm, born in 1918. Ancestors lived in Tamworth and Sandwich. Oil and watercolor painter, woodblock print artist of many Tamworth scenes. Cook Memorial Library houses a collection of her work. Moved to Tamworth with her husband, Woody, a frame maker, where she had a studio and gallery in Tamworth village. Onaway Club member. Died in 2010. Depicted here beside a print she made of the Cook Memorial Library by night. Born 1879. Founder of Tamworth Community Nurses and benefactor of the Chocorua Library. Lived in New Haven, CT and spent 50 summers in Chocorua. A bequest from her and her husband paid for construction of Runnells Hall. Died in 1966. Born 1997 in Tamworth, NH. Home-schooled on a dairy farm, musician, Kennett High School graduate. At the time of the building of the mosaic, working as a fireman and EMT in Tamworth and Meredith, NH. Reverend Samuel Hidden, born in Rowley, MA in 1760. Served in the Revolutionary War. Trained as a shoemaker, he worked his way through Dartmouth College, graduating in 1791. Called to the pulpit of the Tamworth Congregational Church in 1792 and ordained outdoors on what is now known as Ordination Rock. In addition to religious instruction and preaching he is remembered as a musician and music teacher and the founder of the Tamworth Social Library. He died in 1837 and is buried in Ordination Rock Cemetery. Helen Bassett Hidden, born in Tamworth in 1893. Wife, mother of five, pianist and band member, elementary school music teacher, genealogist, one of the founders of the Tamworth Historical Society. Cook Memorial librarian for 34 years. Died in 1964. George Eddy Smith, born in 1940 in Lakeport, NH. A tenth-generation descendant of early Tamworth settlers, the Bryants. Husband, father of two, moved to Tamworth in 1975 after serving in the U.S. Marines and the U.S. Coast Guard. Carpenter, contractor, prison guard, farmer, Shaker style broom and box maker. Member and deacon of the Congregational Church. Died in 2015. Harvey, the pooka, or invisible rabbit, from the play of the same name, pictured with Francis Cleveland in front of The Barnstormers Theatre. Francis Cleveland, born 1903. Actor, director, producer and, with his wife Alice and friend Ed Goodnow, founder of The Barnstormers Theater. Francis also ran a poultry business in Tamworth and served as a Tamworth Selectman. He was the youngest son of President Grover and Frances Folsom Cleveland. Died 1995. Born in 1862. In 1890, as a single woman, she purchased the old Caleb Brown farm, which she renovated and then opened to the public as the Wonalancet Farm in 1892 to immediate success. Married Arthur Walden. Initiated the Wonalancet Chapel restoration, the forming of the Wonalancet Out Door Club, the introduction of the telephone to the area, served as the first postmaster of the Wonalancet Post Office. Advocated the preservation of great tracts of land that became part of the White Mountain National Forest. She died in 1949. Born in Winchester, MA in 1856. Graduated from Harvard Law School and eventually became the secretary of that university. A journalist and nature writer who loved nature study and outdoor exploration; his books include At the North of Bearcamp Water. Died 1894. Edwin Crafts Remick, born 1903. He joined his father’s medical practice in Tamworth after graduating from Tufts Medical School. Doc Remick worked as a country doctor in Tamworth until his death in 1993. He also ran a dairy farm and was active in raising horses and harness racing for decades. He left his home and farm, along with an endowment, to the Town of Tamworth. An iconic view... I love the shadow cast by the deer. ...with the ladies' slippers that grow beside it. Mosaic postcards—get them while you can. Click on a mosaic key to download a PDF of the key. Click HERE or scroll to the bottom to read more about the people and places on the mosaic. These mosaics were created in 2016, in celebration of Tamworth’s 250th anniversary, by hundreds of kids and adults working together with guidance from mural artist David Fichter. Thousands of community member and volunteer hours went into building, mounting and grouting the mosaics. According to math-based estimates made by Brett middle schoolers of the number of tile pieces in the mosaics, the left-hand mosaic contains 21,536 pieces and the right-hand mosaic contains 22,040, for a total of 43,576. The minority are whole tiles; most have been cut by hand into the shapes you see. Whether that number is exact or not, it’s obvious that the mosaics contain a zillion little bits of glass. Every one of those pieces was placed by a human working side by side with other humans. 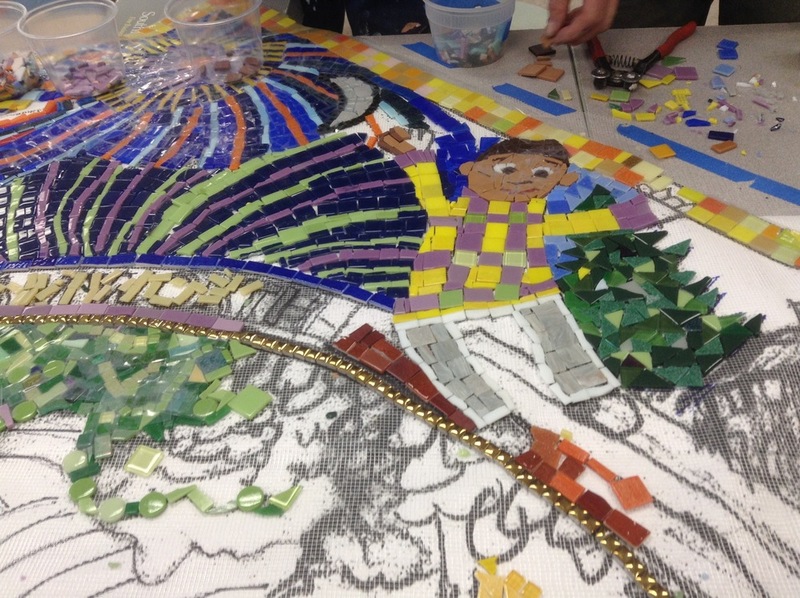 At the beginning, we asked the community what they felt should be represented in the mosaic. Dozens of community members send images and ideas, and every kid at Brett drew a picture of something they love in Tamworth. In conversation with us, David skillfully wove many of these drawings and images into the final mosaic design. Because we couldn’t put everything in the mosaic, think of everything that you see in them as representative of more—animals, activities, people, places; everything has multiple meanings. 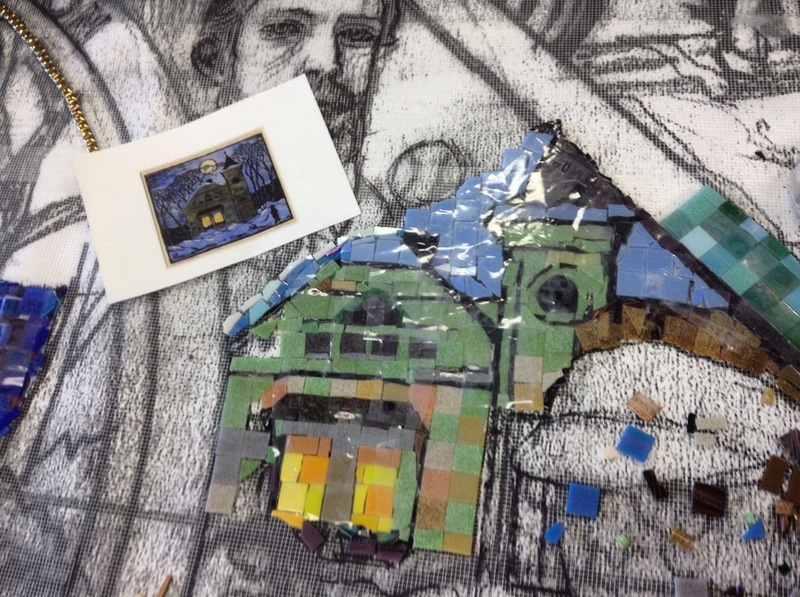 Both mosaics contain images based on drawings by K. A. Brett students; this one contains many kids’ drawings that David has woven together. 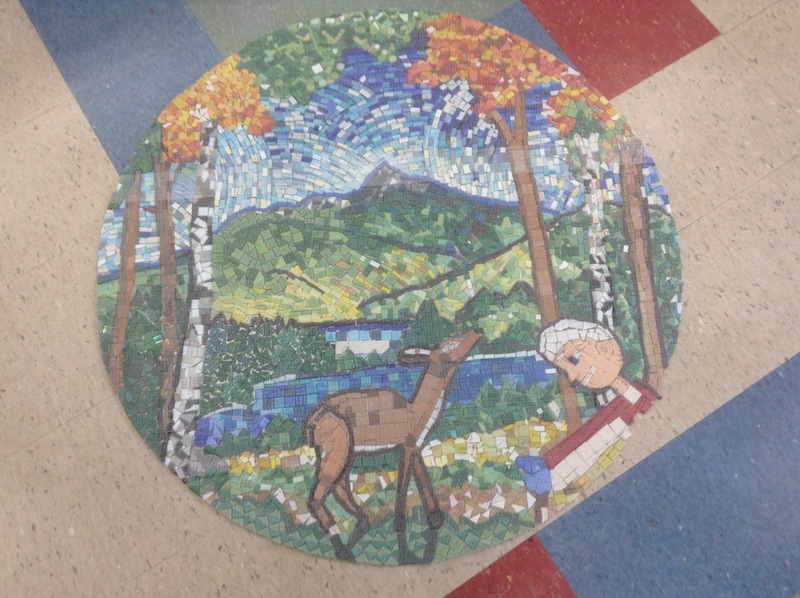 The center of the mosaic depicts Mount Chocorua and Chocorua Lake, a view familiar to many the world over—it’s even on a US quarter. The mountain in the top left of the mosaic is Black Snout in South Tamworth, the highest geographical point in Tamworth (also the bear has a black snout…), and some people believe that the composite apple and dairy farm on the top right is way up at the top of Mountain Road. The church on the left of the mosaic is Saint Andrews-in-the-Valley, in Whittier, and above it to the right is the Wonalancet Chapel. The building on the right of the mosaic is The Other Store in an earlier incarnation, and above it to the left is the Bradbury Jewell house, said to be the first timber frame building in Tamworth. We enjoy the outdoor world all year round, collecting maple sap and boiling it into syrup and spotting wild animals in the spring, fishing for rainbow trout, enjoying our lakes and rivers and watching the fireworks on the 4th of July in the summer, harvesting the bounty of our gardens in the autumn, skiing, skating and racing sled dogs in the winter. And that pig? Is he a Tamworth pig? Maybe the famous one who escaped and made it all the way to school one day? Can you find a four-leaf clover in this mosaic? According to his daughter Melanie, Jimmy Elliot could always find a four-leaf clover in any field they walked in. The people represented on the mosaic are not the “most important” people in Tamworth, or the people who have necessarily made the greatest mark. As well as representing different eras in Tamworth’s history, different ages and genders, this group of citizens represents many aspects of all of us who have lived here through the centuries: Among them are husbands and wives, mothers and fathers. The group includes year-round residents and summer people, those born in Tamworth and elsewhere, those whose family connections cross centuries in Tamworth, or who adopted the place as home in their own lifetime. They are business owners and laborers, farmers and hunters, writers, artists, craftspeople and musicians, military veterans, public servants of many stripes, medical professionals and people of faith. All of them gave much to this community, as have so many of our citizens throughout Tamworth’s 25 decades. And one dog! Will Streeter, born 1997 in Tamworth, NH. Home-schooled on a dairy farm, musician, Kennett High School graduate. At the time of the building of the mosaic, working as a fireman and EMT in Tamworth and Meredith, NH. Elizabeth Lane Whittemore, born 1879. Founder of Tamworth Community Nurses and benefactor of the Chocorua Library. Lived in New Haven, CT and spent 50 summers in Chocorua. A bequest from her and her husband paid for construction of Runnells Hall. Died in 1966. Kate Sleeper Walden, born in 1862. In 1890, as a single woman, she purchased the old Caleb Brown farm, which she renovated and then opened to the public as the Wonalancet Farm in 1892 to immediate success. Married Arthur Walden. Initiated the Wonalancet Chapel restoration, the forming of the Wonalancet Out Door Club, the introduction of the telephone to the area, served as the first postmaster of the Wonalancet Post Office. Advocated the preservation of great tracts of land that became part of the White Mountain National Forest. She died in 1949. Frank Bolles, born in Winchester, MA in 1856. Graduated from Harvard Law School and eventually became the secretary of that university. A journalist and nature writer who loved nature study and outdoor exploration; his books include At the North of Bearcamp Water. Died 1894. Lucy Jackson Blake, born in 1834. Teacher at the Jackson School. She married Ira Blake and they had one child. Ira died in the Civil War. She bought a farm, enlarged the orchard and turned the farmhouse into one of the early boarding houses. She kept diaries 1860-1888 that are now in the care of the Cook Memorial Library. Lucy was a lifelong church worker, a lecturer in the Grange, a caregiver. She had a long and full life – living to the age of 93. Harry Thompson, member of the Lower Brule Sioux Tribe, born 1909 in South Dakota. Descendant of Meriwether Lewis. Tenth Mountain division in WWII. Hunter, trapper. Trained arborist, agriculture degree from UMASS Stockbridge. Moved to Tamworth in 1950. Farmed 13 acres. Boston Post Cane holder. Died 2012. Top right corner, with his horse and buggy in front of Tamworth Congregational Church: Edwin Crafts Remick, born 1903. He joined his father’s medical practice in Tamworth after graduating from Tufts Medical School. Doc Remick worked as a country doctor in Tamworth until his death in 1993. He also ran a dairy farm and was active in raising horses and harness racing for decades. He left his home and farm, along with an endowment, to the Town of Tamworth. Center, to the left of Ordination Rock: Reverend Samuel Hidden, born in Rowley, MA in 1760. Served in the Revolutionary War. Trained as a shoemaker, he worked his way through Dartmouth College, graduating in 1791. Called to the pulpit of the Tamworth Congregational Church in 1792, Parson Hidden was ordained outdoors on what is now known as Ordination Rock. In addition to religious instruction and preaching he is remembered as a musician and music teacher and the founder of the Tamworth Social Library. He died in 1837 and is buried in Ordination Rock Cemetery. The jumpers in the top left corner are every kid who has ever jumped off the big rock at Bearcamp Pond, or anyone who has jumped off any rock into any body of water in Tamworth. The quilt pattern in the bottom corners is called maple leaf. So many in this town through the centuries have made objects of beauty with their hands, both for recreation and for a living. The colors represent spring and autumn. Can you find two hidden objects in this mosaic: an M for “mosaic” and a butterfly, in memory of Steve Damon coming into the village to share his latest photos of some fluttering creature that had taken his fancy. A hive of activity as dedicated volunteers grout one mosaic and mount a second under the tutelage of mural artist David Fichter, captured beautifully by Wyatt Berrier. Just one of many such days on a project supported by extraordinary volunteer efforts and many generous donors, sponsors and funders.